Reality Check: Civil War II, Physics and Free Will – AiPT! This article contains spoilers for the first four issues of Marvel’s Civil War II, on sale now. Brian Michael Bendis likes to stir the s--t. As if disassembling the Avengers weren’t ENOUGH, now he’s gone and and written a pseudo-sequel to perhaps the most divisive comic series in history. And just like the readership, once again the heroes of the Marvel Universe are split down the middle in Civil War II. But beyond the sociopolitical intrigue and the who-shot-who-in-the-what-now, Tony Stark is waging another war, and this time he has very few allies. 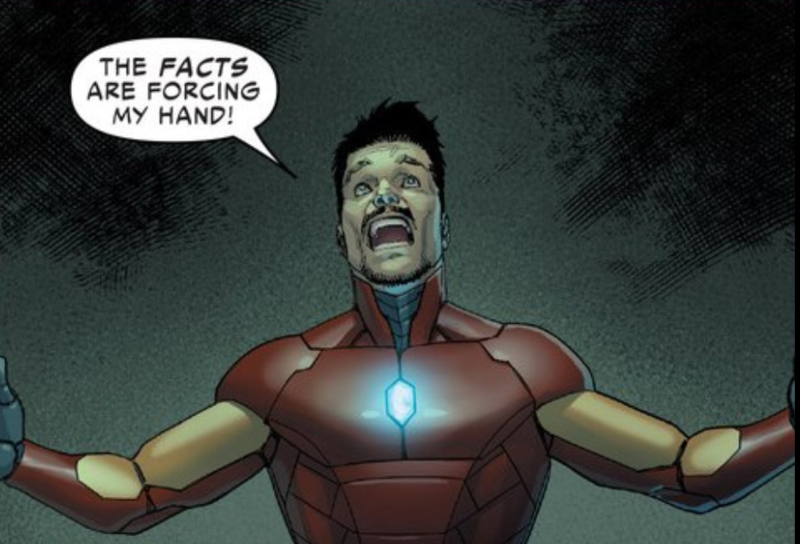 Iron Man may be a futurist, but his seemingly natural ideas in Civil War II #4 about how time flows — and what we can do about it — are actually at odds with much of what we understand about the universe. When a new, future-foretelling Inhuman turns up, Tony Stark doesn’t like it. But is that an emotional reaction after one of Ulysses’ visions leads to the death of Tony’s best friend, Jim Rhodes A.K.A War Machine, or an intellectual rejection of an idea Iron Man isn’t comfortable with? While that’s a perfectly reasonable way to think, given our everyday experience, it’s also a bit like claiming there can’t be a California because I’ve never been there. There’s no doubt that human beings experience a “now.” Lots of them, in fact. Quick grab that “now”! Crap, it’s gone; get the next one! Too late, it’s already “then.” Good thing there’s always another “soon” on the way. But what happens to “nows” that become “thens”? Not too many people doubt that the past exists, but then why don’t we give “soon” the same respect? What’s the difference? According to Albert Einstein, there isn’t any. “Relativity” isn’t just a name. Every good science fiction fan knows people moving at different speeds perceive time differently. Okay, no cognitive dissonance yet. But consider a universe full of different observers, moving at different speeds, in all different directions — with all different reference frames. How do you choose which is the “real” one? Relativity insists that you can’t. Take a look at the Lorentz transformation, one of the linchpins of the theory. The only terms we care about here are t, v and t’, where t is the time as we observe it, v is the velocity at which the other guy is moving away from us, and t’ is our time as he observes it. Thanks to the minus sign, as that v increases, t’ gets smaller, and things we think are happening “now” the other guy thinks happened further back “then.” Flip the minus sign to a plus (so that the other observer is now moving toward us) and we hit the real problem. Our “soon” has become his “now” — before we think it’s happened. It’s okay to take a breather with Tony Stark as you contemplate what that means, because Einstein didn’t like it either. If one of the most well-supported theories in history says there is no preferred reference frame, and there can be an infinite number of reference frames with an infinite number of disagreements about what happened when, we’re left with the queasy realization that all of time, just like all of space, exists at once. Why we perceive a flow, shining a light on certain “nows” as they seem to flit by, is up to some future genius to figure out. But even if the future is already written, there’s probably no way for us to know who the next Einstein will be. That fast-moving a-----e from before can’t tell us. Despite the fact that our “soon” is his “now,” he’s too far away for the information to actually reach him before it becomes “then.” Hold on, though — Ulysses has a different trick up his skull. Werner Heisenberg says, “no.” His famous uncertainty principle states that it’s impossible to measure both the position and velocity of any particle, let alone all of them. Heisenberg himself chalked it up to the observer effect — that you can’t measure something without interacting with and influencing it. The truth is actually more fundamental. You can only guess where something will probably be, as the wave nature of particles ensures you can never really define an “it” to measure. It’s okay, BREATHE! We’re fine with photons, right? Little bits of light waves that act like particles? Well, it goes both ways — particles are pretty much just clumps of waves with really short wavelengths. Accepting this wave-particle wishy-washiness helped bring about the theory of atomic physics called quantum mechanics, a model that’s just as successful as relativity — and loathed by Einstein even more than the idea of a timeless universe. While Einstein’s emotions in this case led him astray (until his dying day), Tony Stark’s motivated reasoning in believing the future can’t be told finally puts him in line with the scientific establishment. But since it’s for the wrong reasons, that coincidence doesn’t last. Quantum mechanics might have killed off determinism, but that doesn’t mean it’s rescued the concept of free will. Lots of people like to think that the probabilistic nature of quantum mechanics gives us decision-making wiggle room in a world previously thought to be plotted out — a gap where our will can influence outcomes one way or another. The problem there is that quantum mechanics operates on tiny scales, the size of an atom or smaller. Throw a few atoms together, and those probabilities start to average out to the most likely outcomes. It’s the reason you can throw a baseball in New York and be pretty sure it won’t land on Saturn. A single human neuron is comprised of trillions of atoms, not really leaving any room for weird quantum effects. It should be noted that “macroscopic” quantum effects have been observed in very special cases, like in ultra-cold, conductive metals and liquid helium. So the precedent is there, but that’s not exactly the kind of stuff that’s in our heads. And even if our thoughts did emerge from the quantum realm, how exactly would “we” do the choosing? What does that even mean? Where would the influence over these probabilistic events come from? There’s still no conceivable mechanism for such a thing. Tony Stark has always been able to exert his power and foresight, shaping the Marvel Universe to his will. Or so it seems to him. It’s not surprising, then, that Iron Man would react negatively when confronted with something that might prove he’s not really in control after all. Stark isn’t the first great thinker to let desires cloud his reason, so his characterization in Civil War II is not beyond belief. Realistically, the greatest example of wishful thinking here is that Hawkeye could get a trial and receive his acquittal all before She-Hulk even woke up from her coma. You Shouldn’t Care About ‘Suicide Squad.’ And That’s Okay.